Rafa Benitez. A name that induces despair in the hearts of most Chelsea supporters and even fury for some. Me though, I’m past both of those emotions now. In fact, after our five minute collapse in the game against Reading, I just feel total despondence. I’ve written somewhere before about the Five Stages of Grief, it escapes me now what particular Chelsea trauma prompted that but I can’t imagine it would have been anywhere near as relevant then than it is now, because if ever the grieving process (as described by Elisabeth Kübler-Ross) was to find its place in football, it’s at Chelsea right now. Denial; anger; bargaining; depression; and, acceptance. Recognise these feelings? Because in no particular order, I would imagine most of us have felt each and every one of them at some point since November. Sound a bit airy-fairy? Maybe so, but there’s no question for me, it feels like I’ve been grieving for Chelsea for months. The denial bit was immediate, “we can’t have appointed Benitez”, “it can’t be true” and it’s the one thing that’s persisted for me. Not once have I listened to anything he has to say post-match, nor have I read anything he’s had to say in the press. I just feel too strongly about his appointment to even acknowledge it. Anger, well I think we’ve all felt that since November 21st last year whether that anger is about his appointment itself, borne out of the frustration around his insane substitutions, or the performances that seem to plunge new depths week upon week, it’s a feeling that’s never far from the surface for most Chelsea supporters this season. Bargaining might seem a bit more subtle – although it’s probably not. From deals with him upstairs and the promises of a few extra Hail Mary’s for Rafa’s exit to clutching onto ever increasing match-day rituals in the hope that the right combination will turn our fortunes around. Don’t pretend you don’t know what I’m talking about – it probably takes half of us so much time to prepare for a game now, OCD sufferers would feel slapdash in comparison. Depression. Well, quite frankly that feels like a permanent state lately, with each game that goes by making us seriously consider an appropriate prescription – except you can’t medicate this one, so the black cloud follows us everywhere. A bit ridiculous just how much we allow football to affect our mood but that’s what we buy into when we invest so much in our relationship with a club – a bit like marriage and that “for better or worse” stuff, except without the consummation. That just leaves the acceptance – and I’d be willing to put money on most people hurling at least a dozen expletives at the thought of that. Of course I’m not referring to the acceptance of Benitez at our club though because it’s certainly something that’ll never happen for me, obviously it’s more about resigning ourselves to the fact that this process of grief is set to continue for a while. Yes, we might get the odd decent win here and there but just like the Liverpool’s and Arsenal’s we deride so much, those wins will have to be our cup finals. We’ve been safely seen out of the Champions League and any cup we stood a chance in, we’re hearing the players are as lost with his tactics in training as we are with his substitutions and whilst we were four points adrift of top spot before Di Matteo’s departure, we’re now 13 behind and fading every week. A doom and gloom prediction maybe but I’m just struggling to see how Rafa’s ‘taken us forward’ from the side that dropped just two points in their first seven games of the season. 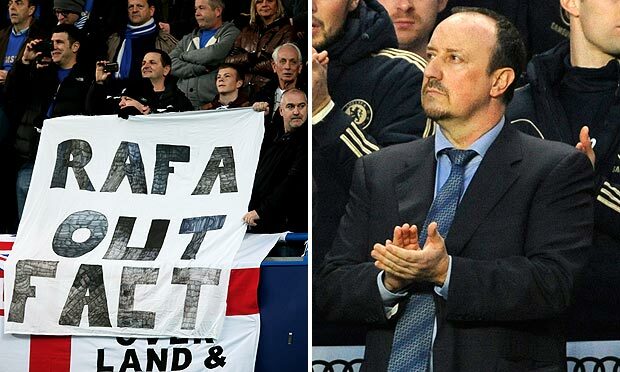 Rafa is superb.Just get behind him give him what he wants and let’s move on. As a season ticket holder he is the best man. Liam you have to be kidding me. He’s garbage. We have no chance of winning with a manager that cannot at least maintain the caliber team that he inherited. He and Torres should have both left in January. I’d rather have Zola than Benitez. I’d rather have Hughes than Benitez. As a non-season ticket holding, ignorant and despicable Yank, Roman damned the team the day he appointed Benitez. Raft is obviously a mistake now. We can all see that. The biggest reason is the toxic atmosphere we have all seen at the club and the terrible home form that come from that. You could say that isn’t his fault but who cares. It’s a fact and its badly hurting us. I think sacking him now would be a bad move though. How would other managers look at that situation? Badly I think. We are locked into a loveless marriage until the end of the year. It’s awful to admit it but this is the ultimate transition year for us now and it has become all about the future. Whatever we do now has to be done with that in mind. We shouldn’t sack him because i might make it harder t get the manager we need next year. I’d say that this is what the board think too. If they backed him they would have sanctioned the obvious buys we need at central midfield. It’s obvious and I’m sure they can see it. They just have to have concluded that any new purchases have to be approved by the permanent manager next year. It’s obviously not. Benitez. The one thing to do is for roman and the board to talk with him about his obvious errors now with tactics and try and influence a change. That’s the best we can today. Lets look forward to better times. Testing times. Its hard to watch the club take massive steps backwards. Appointing Rafa was a clear mistake and the only thing keeping him and Torres there is Roman’s denial that he fucked up. If he truly cared about the club he would of given AVB time and money. Granted he didn’t feel right at the time. we just need a Fergie of our own. A legacy, a standard. Players fighting for game time. Watching every Chelsea match nowdays is an absolute painful experience!!!!!! The sense of helplessness in watching our club go down under Rafa.